I grew up eating Chick Peas - mainly due to my mom becoming best friend's in a new Country with a wonderful lady from Greece (whom I now call aunt). My family went through a major Mediterranean stage, where couscous , Tabbouleh , Hummus , Mediterranean Chicken, Lamb, Zucchini, Greek Salad, Spanakopita, Lamb balls with parsley and feta, and wine leaves dominated each and every year. I will have to post a revised recipe of the Stuffed Grape Vine Leaves - they were incredible! Since summer is nearing to an end, and gracing us with what Vitamin D she can, I thought I'd post a quick, refreshing, healthy recipe that one can keep in the fridge for whenever. In fact, the more in marinates in the fridge, the better it tastes! 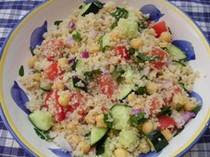 I have decided to up the 'health factor', by subbing the couscous with Quinoa , although any seed/grain will work. You can also omit the Quinoa , and add some crumbled feta , or goat cheese instead. 1 1/3 cups water or BROTH !! 1/4 cup white wine vinegar (or red , Balsamic etc). If you can find infused vinegars (fig, blueberry, strawberry etc) then give them a try! Great way to add flavor without calories! 1 TB Oregano , Rosemary or a Greek Style Seasoning Mix . Optional- 1 TB Olive Oil . 1. Cook Quinoa according to directions of package. I recommend boiling it in water/bouillon cube or broth mixture! Try adding a bit of sage and lemon juice to the water! Once cooked, remove from heat and let it cool (about 5-7min). 2. Mix the Quinoa , Garbanzo Beans , Cucumber, Tomato, Onion, Parsley and all optional add-ins into a large bowl and mix well! 3. Separately, mix the dressing ingredients, and pour over the salad. 4. Cover and let it chill for at least 2hrs or overnight. Optional add-ins: Tuna , Chopped Zucchini/Squash, Goat Cheese /Feta , Lima beans /pinto /kidney /Navy Beans , capers , Cilantro , Tahini , KalamataOlives / Avocado, and Bell Peppers. I've even put in chopped, left over cooked carrots before. You can serve this on a bed of Spinach, alone, or with a meal. The BEST part is, after a week or so, you can just blend it into a dip or spread! I like that one can experiment with DIFFERENT types of Quinoa - from the normal, to the red andblack ! Quinoa is an Ancient Aztec Seed, and just so happens to have the highest protein content among all seed/grains. It contains all 8 Essential Amino Acids (or 9 depending on which school of thought you believe in): Isoleucine, Leucine , Valine, Tryptophan, Phenylalanine, Methionine, Lysine, Threonine- and sometimes Histidine- needed by infants; is easy to digest and is full of antioxidants! This Gluten-free seed -which is related to the Spinach family, is full of phytonutrients, antioxidants, enzymes, can help balance your blood sugar, and provides you with more Amino Acids, Magnesium, Manganese, Potassium, Fiber, Zinc, Copper, Calcium, and Iron than most other grains. Quinoa is as close to a complete-whole food as you can find! It also acts as a prebiotic, and doesn't feed Candida, Fungal Infections etc, as many other grains do. Along with the Quinoa , Garbanzo Beans are also full of Cholesterol lowering Fiber, Magnesium, Protein (the amino acid Tryptophan especially), Iron, Manganese and folate. 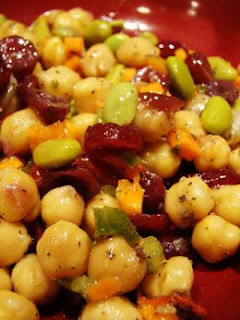 Garbanzos are an excellent source of the trace mineral, molybdenum, an integral component of the enzyme sulfite oxidase, which is responsible for detoxifying sulfites. 1. Have you experimented with RED/BLACK Quinoa? 2. What cuisine did you grow up with? I love quinoa but I prefer the regular one instead of the red type. I had the latter at Le Pain Quotodien the other day and it just wasn't as good! I had no idea there was a black version! I grew up with tons of Indian food. Lots of grease, tons of rice. Luckily my mom knows how to make it healthy too and I have a newfound appreciation for it now. Sorry you are going through a tough time right now Barbara! I am not a professional but don't hesitate to come to me for advice / reassurance / solace. I mean that! Quinoa is good and all, but I had it with like every salad when I was in treatment so I'm a little bit quinoa-ed out! I'm also sorry about your tough time, dont hesitate to email me if you want to rant or anything. Im here! Ameena- I love you! You are amazing! Thanks for always making me feel better! Eden- That's why I added you can sub in any grain/seed: couscous, amaranth, FARRO,millet, buckwheat,barley, spelt, oats, teff, KAMUT, Indian Grain Rice, Jasmine rice, Basmati, Wild rice,Sorghum, add more lentils, other legumes, cracked wheat (berries) etc! Just have fun with it and enjoy! I love chickpeas and to be honest, at least a few of my meals each week are huge bowls of brown rice, veggies, chickpeas and butter. SOOO good. I have a box of quinoa in my pantry I haven't experimented yet, as I'm a little lazy and a little intimidated. So, now I might just have to do that! Chick peas ROCK! Have you ever had them with couscous? So good.